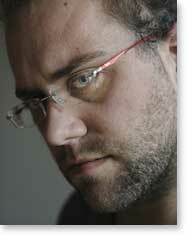 Joost Vandecasteele (1979) writes stories, novels and plays and is also a stand-up comedian. In 2009 he published a collection of short stories called How the world functions perfectly without me (Hoe de wereld perfect functioneert zonder mij). This book is currently on the shortlists of the 2010 Selexyz Debut Prize and Academica Debut Prize.